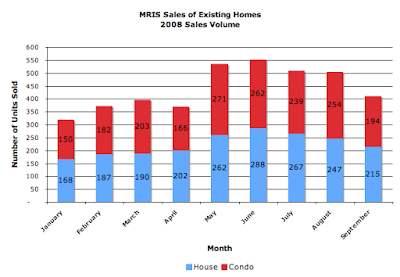 MRIS released its data for signed sales contracts for existing home sales in September 2008 yesterday. 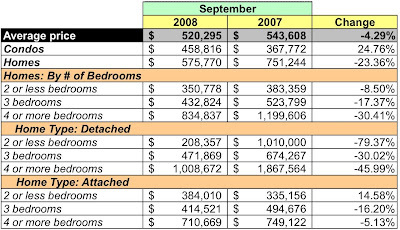 Compared to September 2007, unit sales are flat, there was lower dollar volume, but average sales prices for condos skyrocketed while those for single family homes tanked. Since condo unit sales fell 12.61% and I know that about 5% of condo unit sales sold for more than $1M, 2 for more than $2.5M, I'm going to assume the apparent resurgence in the condo market's average sales prices is illusory. The number of units going under contract in September compared to August fell 18.4%. For condos, the number fell 23.6% and fell 13% for homes. Similarly, dollar volume [September to August] dropped precipitously. Overall, September's total dollar volume was down 23.75% from August. Condos, down 16.08%; homes, down 28.46%. 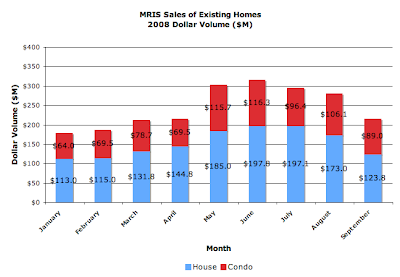 YoY, unit sales for condos were down 12.61% while up 9.02% in dollar volume [thanks to those million dollar condos]. Homes were down 12.35% on dollar volume, but up 14.36% on unit volume.The majority of units sold in September were single family homes. 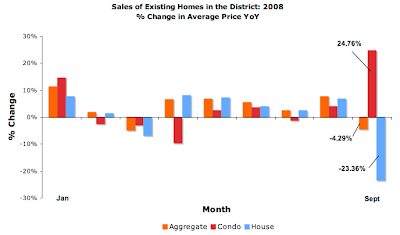 Comparing September to January 2008, the aggregate average price in the District has fallen 6.51%. Average prices for condos are up 7.51% for the year while those for homes have fallen 14.37%. Based on September's sales volume, there's now 7.87 months of inventory for condos and 9.15 months for homes, a 38.07% increase for condos and an increase of 27.45% for homes from August. 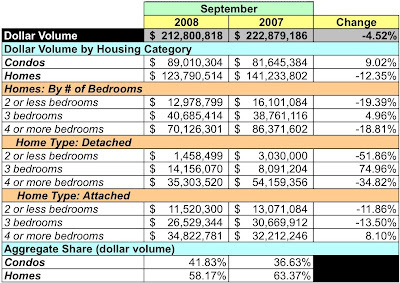 Compared to September 2007, the number of condos listed has fallen 6% and risen 8.5% for homes. Are you going to have the next list by address available soon? I've bought the others and am trying to figure out the latest sales in several condo projects before making an offer. Interesting to see how the close the transaction volume is. I've got June's data, just haven't had the mental energy to finish processing it. I'll get on it. Troy: yes, and dollar volume is down. Not good. Thanks for confirming what I already knew. By waiting since 2003 for prices to come down, I have been priced out forever. I think you're giving up too soon. I've not heard anyone declare that no more price declines are allowed. Given relatively high mortgage rates and the declining economic environment, I would foresee more opprtunity IF you have cash in the bank, good credit, and a reliable income. The key indicator in the data - to me - is that dollar volume is down while aggregate demand is stagnate, which tells me prices are falling. The collapsing August-to-September data tell me that the market's still encountering choppy waters. The fact that average prices may be up for condos, I attribute that to the outside skewing brought on by those handful of $1MM+ condos. 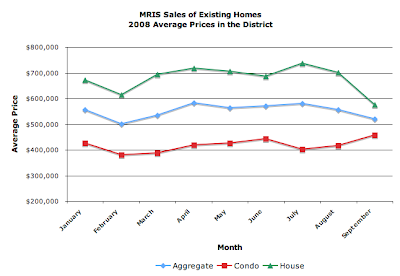 MRIS data isn't granular enough to get a real idea of price trends. Don't give up; the "calorically challenged" lady hasn't warmed up yet.